It might sound a rather frivolous title, but don't be fooled - this is a book with serious historical substance. The life of Martin Luther has been much chronicled over the years, but Douglas Bond has taken it and put a new slant upon it in the best traditions of historical fiction. He shows us the man and his times through the eyes of his wife Katharina von Bora. This brings their relationship and their home life before us - the ex-monk and the ex-nun in the former monastery at Wittenberg. It was a busy, almost chaotic place, what with all the students that boarded with them. Here Luther held court with his famous tabletalk, played the lute and composed hymns, and brought up his children. Here the practical and human side of his Reformation theology was worked out. We see Luther warts and all - by turns explosive, tender, witty, depressive. We admire his industry, his literary output, his devotion to scripture and his courage, but the author also takes care that we see that the best of men are but men at best. Careful research into Luther's books, sermons and letters has furnished him with material to weave into the dialogue and give credibility to the story, and in this Douglas Bond has once again done a magnificent job. 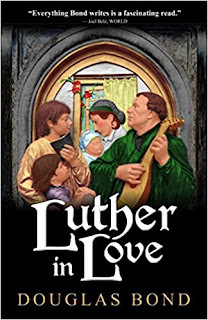 This is not action packed fiction, but the tale of the drama of those times of God-wrought change, and the depiction of the clash of ideas, together with a portrayal of Luther's powerful personality means that one finishes the book informed, stirred and edified. 'Luther in Love' by Douglas Bond is published by Ink Blots Press in paperback for £11.99. It is currently only available in the UK from us. We are a small independent Christian bookshop. A husband and wife team who want to promote free grace teaching, encourage reading, and stay in business - in that order. Want to join a Reading Club? Go to Reading Together if you are already a member.